Charlie Austin came off the bench and scored with his first touch to beat Leeds and give Neil Warnock his first win as QPR's interim manager. Austin headed in his eighth league goal of the season from a corner to end the R's run of four games without a goal. Leeds goalkeeper Marco Silvestri made several important saves from Austin and Tjaronn Chery to keep it at 1-0. QPR kept pressing but their fourth straight home clean sheet ensured a first league win in over a month. With top scorer Austin on the bench and not deemed match fit following a calf injury, the hosts struggled to find a cutting edge in the first half. Grant Hall headed over from Alejandro Faurlin's corner before Nedum Onuoha's long range shot flew off target, while Chris Wood blazed Leeds' best chance over from a narrow angle. The turning point came when Warnock introduced Chery and Austin 10 minutes into the second half, and after Chery won a corner, Austin got free to head past the helpless Silvestri. Austin then headed over from Matt Phillips' free-kick before another header forced Silvestri into a reflex save. Phillips fired a shot wide and Silvestri was once again called into action to stop a low Chery effort. Leeds winger Stuart Dallas flashed an effort across goal to jangle the home fans' nerves, but QPR held on to secure a valuable win. "We haven't got a lot of goals in the squad, we know that. That's why I went with the team I did, moving Junior Hoilett inside and also bringing young Mikey [Petrasso] in. "We knew Charlie couldn't play more than half an hour , but I always thought we were going to create chance for him. We know Charlie will always score goals. "He was really disappointed not to be involved at Middlesbrough last week and has enjoyed training this week." Leeds United boss Steve Evans: "We were disappointing in every aspect of the team. "We can't be waiting until the last 10 minutes to get the ball down and pass it and create chances. We're a long way short of where we need to be. "This is a famous football club that has had world-class stars. It's a privilege to represent this club and we need to show work-rate and desire. "I don't think we have that many good players and we certainly don't have many very good players at this level." Offside, Queens Park Rangers. Tjaronn Chery tries a through ball, but Matthew Phillips is caught offside. Corner, Leeds United. Conceded by Paul Konchesky. Substitution, Queens Park Rangers. Karl Henry replaces Junior Hoilett. Attempt missed. Lewis Cook (Leeds United) right footed shot from the right side of the box is close, but misses to the left. Assisted by Stuart Dallas. Attempt blocked. Stuart Dallas (Leeds United) right footed shot from the centre of the box is blocked. Assisted by Jordan Botaka. Attempt missed. Chris Wood (Leeds United) right footed shot from outside the box is too high. Assisted by Lewis Cook. Attempt missed. Junior Hoilett (Queens Park Rangers) header from the centre of the box misses to the right. Assisted by James Perch with a cross. Tjaronn Chery (Queens Park Rangers) wins a free kick in the attacking half. Attempt saved. Lee Erwin (Leeds United) right footed shot from outside the box is saved in the bottom right corner. Assisted by Stuart Dallas. Attempt missed. Tjaronn Chery (Queens Park Rangers) right footed shot from the right side of the box is high and wide to the right. Attempt blocked. Matthew Phillips (Queens Park Rangers) right footed shot from the left side of the box is blocked. Assisted by Paul Konchesky. Attempt saved. Tjaronn Chery (Queens Park Rangers) left footed shot from the centre of the box is saved in the bottom right corner. Assisted by Charlie Austin. Attempt missed. Matthew Phillips (Queens Park Rangers) right footed shot from outside the box misses to the left. Assisted by Tjaronn Chery. Attempt blocked. 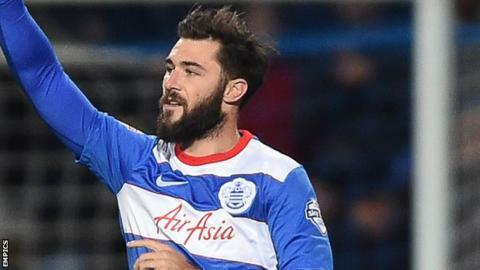 Charlie Austin (Queens Park Rangers) right footed shot from outside the box is blocked. Assisted by Nedum Onuoha. Attempt missed. Alejandro Faurlin (Queens Park Rangers) left footed shot from outside the box is close, but misses the top right corner. Assisted by Matthew Phillips. Chris Wood (Leeds United) wins a free kick on the left wing. Attempt saved. Charlie Austin (Queens Park Rangers) header from a difficult angle on the left is saved in the top right corner. Assisted by Matthew Phillips with a cross. Corner, Queens Park Rangers. Conceded by Scott Wootton. Alejandro Faurlin (Queens Park Rangers) wins a free kick in the defensive half. Substitution, Leeds United. Jordan Botaka replaces Alex Mowatt.